"In 1905 the Tomson Brothers bought a mill. Help us preserve it." Ralph Hunt built the earliest section of this Mill to process wool sometime around 1810. His wool business failed, however, thanks to a permanent downturn in the market for domestic cloth. By 1820 Ralph confessed to the Census that “the establishment has been doing very little for two or three years past. The demand for sale of the cloths and sattinets are very dull…a few of the farmers get their wool manufactured, but from the low prices of foreign cloths.” Things did not improve and Ralph lost all of the family’s property, more than 400 acres and mills on both sides of the river. He defaulted on his mortgage, and the Taylor family took ownership. From 1828 to 1834 John Bray and John B. Taylor took over running the Woolen Mill. The Taylors, now the dominant merchant family, changed the name of the town from Hunt’s Mills to Clinton, after the popular New York governor DeWitt Clinton. Bray and Taylor continued in the woolen business but they also diversified by grinding feed, flour and stone plaister, as well as by selling chestnut wood for rails. They even opened a dry goods establishment which carried everything from china to sheet iron. But Bray and Taylor also failed in their business, selling it for three quarters of its purchase price. John W. Snyder, the new owner, refitted the Mill for grist and ceased wool production. But he too quickly fell into debt, and lost the property in 1842. After a swift series of owners, the Easton Bank split the site into a mill and a quarry. In 1847 the Mill was sold to John F. Stiger and John A. Young, who used it to grind flour and grist. In 1868 Young sold his part of the business to his partner, John Stiger, who continued to operate it as a grist mill. In 1871 Stiger sold the mill and it again changed hands several times before it was purchased by Philip Gulick in 1873. Gulick ground grist on the third and fourth floors of the mill and produced peach baskets in the first level. In 1892 Gulick set up The Clinton Illuminating and Water Co. on the second floor of the mill. It provided electricity for Clinton’s street lamps. 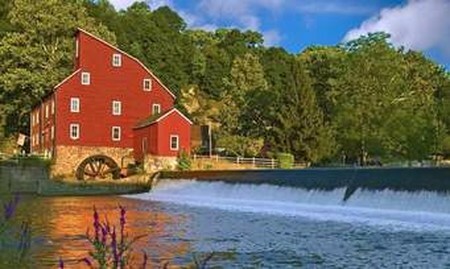 Gulick died in 1901 and his widow rented the Mill to Elmer and Chester Tomson and in 1905 they purchased it outright. The talc mill was in operation day and night, with three run of stone, three elevators and one crusher. Electricity powered the lights until midnight, when six kerosene torches took over. Two storage sheds had been built between 1903 and 1912, one small in front of the mill and a larger behind. In 1928 Chester sold the mill to the Clinton Water Supply Company, and the mill ceased operations. Today the Mill houses a large portion of the Museum’s collection. Exhibits on the 1st, 2nd, and 4th floors share a small part of the history of this building and its ever changing role within the Clinton Community.